This study is quite important because it explains one way that acupuncture works to regulate pain at a cellular level. While those of us who have experienced acupuncture need no proof that it works for pain, it is still useful to have a mainstream university explaining the mechanism for doctors and (dare I say it) insurance companies who restrict coverage to one or two codes. 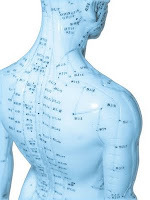 The University of Michigan Health system has just released the results of a new UM study that showed Chinese acupuncture affects your brain’s ability to regulate pain. Using brain imaging, researchers at the U-M Chronic Pain and Fatigue Research Center are the first to provide evidence that traditional Chinese acupuncture affects the brain’s long-term ability to regulate pain. The complete study will be published in the September Journal of NeuroImage. Acupuncture increased the binding availability of mu-opoid receptors (MOR) in regions of the brain that process and dampen pain signals – specifically the cingulate, insula, caudate, thalamus and amygdala. Traditional opiod painkillers, such as morphine, codeine and other medications, are thought to work by binding to these opioid receptors in the brain and spinal cord. “The increased binding availability of these receptors was associated with reductions in pain,” says Richard E. Harris, Ph.D., researcher at the U-M Chronic Pain and Fatigue Research Center. “One implication of this research is that patients with chronic pain treated with acupuncture might be more responsive to opioid medications since the receptors seem to have more binding availability,” Harris says. The study participants included 20 women who had been diagnosed with fibromyalgia, a chronic pain condition, for at least a year, and experienced pain at least 50 percent of the time. During the study they agreed not to take any new medications for their fibromyalgia pain.